Hotel: Restaurant • Meeting Room• Wi-Fi throughout • Rooms for reduced mobility • Lift • Library room • Tourist information. A traditional 19th century buildings houses the Hotel de l’Horloge in the heart of tourist Avignon, surrounded by little cafés and shops and overlooking the Palais des Papes. Offering unique and cosy rooms the Hotel de l’Horloge mixes traditional with modern to create a charming hotel. Found on the Place de l’Horloge the Hotel de l’Horloge is set amongs t the rich historical and tourist attractions including the Palais des Papes and is surrounded by local cafés, restaurants and boutiques, making it ideal for sightseeing and shopping. The hotel also has excellent transport links with only a 5 minute walk to the bus station and a 10 minute walk to the Avignon TGV railway station. The Marseille Provence airport is 45 minutes from the hotel. 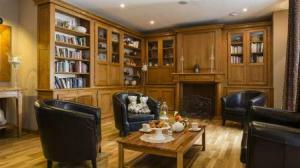 The Hotel de l’Horloge has a number of facilities including a meeting r oom and library room. The hotel also offers free high-speed wifi across the hotel. In the restaurant both a hot and cold buffet are served for breakfast. Additionally the hotel offers a reduced charge for parking in the secure public car park 2 minutes away. With indiviually designed, modern and cosy rooms the Hotel de l’Horloge offers a variety of room grades including Tradition, Superior and Privilege. 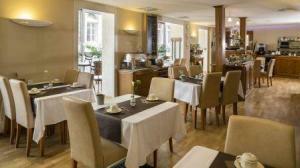 The hotel also offers Suites, including Junior Suites and Terrace rooms overlooking the Palais des Papes. With all reservations in rooms above Tradition to hotel offers a special welcome gift. The hotel also offers rooms specially designed for reduced mobility whilst some rooms come with tea and coffee facilities and room service.